The Government is providing NOK 60 million over a period of three years for mine action in Sri Lanka, the Norwegian Ministry of Foreign Affairs stated. “Sri Lanka has been heavily contaminated by landmines, but the country is now approaching its goal of becoming mine-free. This year, Norway holds the presidency of the Mine Ban Treaty, and intends to help Sri Lanka achieve this important goal”, said Minister of Foreign Affairs Ine Marie Eriksen Søreide. 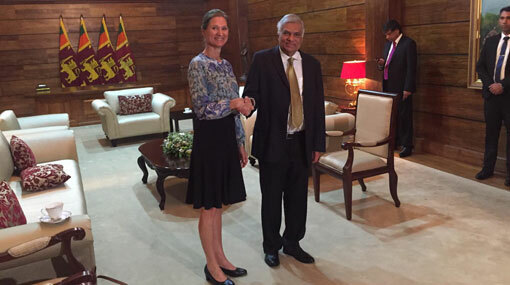 State Secretary Marianne Hagen announced Norway’s contribution at a meeting with Prime Minister Ranil Wickremesinghe in Colombo yesterday (05). With the help of national and international organisations, Sri Lanka has carried out extensive mine clearance activities. In December 2018, 94 % of the mined areas had been cleared. Norway’s contribution will support the vital efforts the authorities are making in this area. ‘Mine clearance efforts are an important part of the reconciliation process, and mean that families who were forced to leave their homes during the war can return home safely’, Ms Eriksen Søreide said.